Foodshed, like watershed, emphasizes the connections between the area where food is produced and where it is consumed. In May of this year, Locavores, a San Francisco "group of concerned culinary adventurers" hosted an Eat Local Challenge. The San Francisco foodshed is 100 miles or less. I missed the May challenge, but I have been trying to eat more locally. For example, I recently bought fruits and vegetables from my local farmers' market, a known source of local produce. The Berkeley Farmers' Market is held in three locations - downtown, North Berkeley, and in my neighborhood, at Derby and MLK. 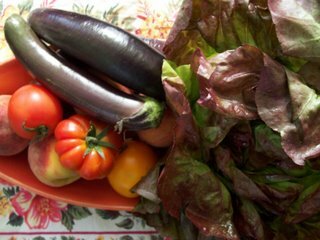 I purchased red butter lettuce from Blue Heron Farms (Corralitos, CA); organic Red Haven peaches (Esparto, CA); eggplants from Full Belly Farm (Guinda, CA); and Riverdog Farm tomatoes, also in Guinda. Corralitos and Guinda are approximately 91 miles from Berkeley and Esparto is a 74 miles away. Full Belly Farm and Riverdog Farm are community supported agriculture farms(CSAs). Read our previous CSA post. What types of institutions make a neighborhood? Nora Ephron on "the sense of neighborhood"